BANGKOK – POLICE in Thailand have seized six tiger cubs in a raid on the home of a suspected weapons dealer, an anti-wildlife trafficking organisation said on Wednesday. The owner, living in eastern Sa Kaeo province, did not have a permit so the tigers have been taken into the care of the Department of National Park, Wildlife and Plant Conservation, according to the Freeland Foundation. It said that tigers can fetch US$30,000 (S$38,000) on the black market and despite their endangered status continue to be purchased for their bones and organs used in medicines, while their skins are prized as trophies and ornaments. WASHINGTON— The Obama administration denied Endangered Species Act protection today to three Utah plants that government scientists have said need those protections to avoid extinction. Instead, the federal government designated the species as “warranted but precluded” and placed the plants on a growing list of “candidate” species, where they will wait indefinitely for the protection they need to survive. To date, President Barack Obama’s Interior Department has used the warranted-but-precluded designation for 21 species — more than any other administration. The U.S. Fish and Wildlife Service under President Obama is repeatedly refusing to grant species the protection for which they are known to qualify, adding them instead to the waiting list, where 257 species now face extinction. On average, the species on the candidate list have been awaiting protection there for 20 years; at least 24 species have gone extinct while waiting. To date the Obama government has only granted Endangered Species Act protection to 58 species, for a rate of 29 species per year. In contrast, President Clinton protected 522 species under the Endangered Species Act for a rate of 65 species per year, while the first Bush administration protected 232 species for a rate of 58 per year. The three plants added to the candidate list today are all flowers from Utah threatened by grazing, mining and climate change. Frisco buckwheat is a pinkish-white, perennial flower that grows in mounds; Ostler’s peppergrass is an herb in the mustard family with purplish flowers. They occur in four locations in the San Francisco Mountains in Beaver County, Utah. The third species, Frisco clover, has hairy, silver leaves and reddish-purple flowers and is known only from five populations in three mountain ranges in Utah’s Beaver and Millard counties. The Center and other groups have an active lawsuit in Washington, D.C., showing that continued delays in protecting candidate species are illegal because the U.S. Fish and Wildlife Service is not making expeditious progress listing species as required by the Endangered Species Act. Learn more about our campaign to earn protection for all the candidate species. Two major private airlines are being used in the smuggling of endangered species, according to the Wildlife Crime Control Bureau. After a senior WCCB official brought this to the notice of Environment Minister Jairam Ramesh on Thursday, he promised to take up the issue with his counterpart in the Civil Aviation Ministry Vayalar Ravi. The issue was brought up at a meeting of security agencies convened by Mr. Ramesh to discuss the problem of illegal smuggling of wildlife. The WCCB official requested the Minister to take action against these airlines, possibly including the cancellation and suspension of their licences. The WCCB also pointed out that it often faces difficulties in obtaining airport passes for its officials trying to check smuggling cases. As the sun sets on 2010, the year South Africa hosted the Fifa World Cup with great success, the country is faced by a scourge of senseless murders. I’m not talking about the almost 17,000 murders of humans in the country last year, I’m referring to the 318 (308 White and 10 Black) rhinos that were murdered for the lump of keratin on the end of their faces. This wave of poaching comes at an especially unfortunate time, just as the animal’s populations were starting to recover from being hunted to within a horn’s breadth of extinction. As terrifying as this is (I am not a fan of extinction events – except maybe the dinosaurs), I’m not writing this article to address the poaching itself. I would like to try and straighten up a few of the myths surrounding the medicinal use of rhino horn. I was first introduced to the idea that rhino horn was used to enhance the sexual virility of Asian men by the unstoppable Leon Schuster in his movie Oh Shucks! Here Comes UNTAG! For a long time I believed that all the rhino poaching was for horns to make Chinese men horny, but I was wrong. I was not alone however, because this is a common misconception. Rhino horn is not, in fact, prescribed as an aphrodisiac in traditional Asian medicine. What, then, is rhino horn used for? In Yemen, rhino horn is used for the carved handles of ceremonial daggers called jambiya. These daggers are given to Yemeni boys when they are 12 years old and serve as a sign of the young mans religiosity and as a personal weapon. Medicinal use of rhino horn is common throughout India, Malaysia, China and South Korea. It is believed that there may be some truth behind the rhino horn’s ability to detect poisons which is linked to the composition of the horn. Rhino horns are composed largely of the protein keratin, also the chief component in hair, fingernails, and animal hooves. Many poisons are strongly alkaline (or basic), and may have reacted chemically with the keratin. No. Both Hoffman-LaRoche (in 1983), the Chinese University of Hong Kong (in 1990) and the Zoological Society of London (in 2008) conducted tests of the medicinal properties of rhino horn. They all arrived at the same conclusion: rhino horn is of no use to anyone except the original owner. To all this, I say that something that works for everything usually works for nothing. I also say that something that has been used for hundreds or thousands of years does not make it right… Essentially, ingesting rhino horn is the same as chewing your own fingernails. That is the extremely sad story of rhino poaching today. We are hunting this magnificent beast into extinction for a few daggers and a deeply implausible and disproven medical tradition. We need better education in the societies demanding these treatments, we need more effective anti-poaching enforcement, and we need to stop killing rhinos. Will poisoning rhino horns halt rhino poaching? PanARMENIAN.Net – In December 2010, a Red Book, listing rare and endangered species, was republished for the first time in 20 years, the head of biodiversity policy department at Armenia’s Nature Protection Ministry stated. Among those listed 143 animal species are noted as endangered, whereas 249 species are on the brink of extinction. “Since proclamation of independence, 2 trout species out of 4 became extinct in Armenia,” she noted. In 2007, Armenian government allocated AMD 31 million for review and republishing of new Red Book edition, with 500 copies released. 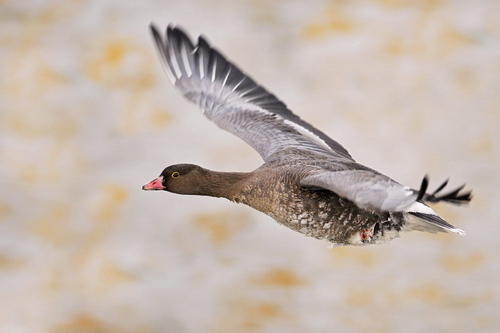 Extraordinary weather conditions in the Kalmykya region of Southern Russia bordering the Caspian Sea have led to the deaths of at least several hundred – and possibly thousands – of rare geese. Snow and rain fell together, which in combination with viciously low temperatures in the region of -10ºC transformed the snow into a thick layer of ice. The speed at which this happened almost instantly created an ice shell which entombed the birds in a cocoon of ice 15cm thick.hunters discovered the tragic scene, estimating that up to a thousand geese were dead. The majority of the geese that perished were juveniles so less able to fight their way free of the ice. 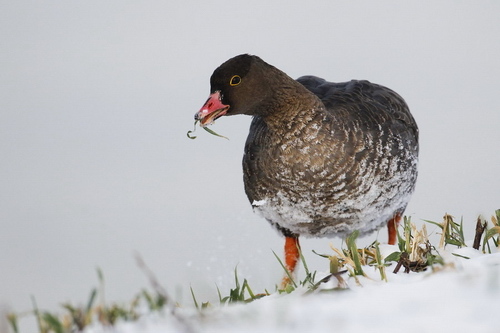 Lesser White-fronted Goose © Mateusz Matysiak, from the surfbirds galleries. Endangered red- breasted geese, lesser fronted white geese and some little bustards were caught by this freak of nature. The hunters managed to save 17 red-breasted geese by breaking them from their ice graves. They took them to their home in Priyutnoe village where they managed to revive them in a heated hen-house. Local These hunters were instrumental in alerting the local Ministry of Natural Resources about the freak weather conditions and the ensuing tragedy. Dr Peter Cranswick of WWT said: “This is a blow to red-breasted geese conservation efforts. We have been working with the countries where these very striking and endangered geese nest and migrate, and will be sending a conservation team to Bulgaria next week – which is where the majority of these geese spend the winter. Following the rescue, all but three of the saved 17 geese were able to be released back into the wild, the three that were unable to fly were taken to the “Esmeli” center for wild animals in Kalmykya where they will be looked after until they can be released into the wild next spring. The hunters, Vladimir Povolozky and Viktor Savtchenko, estimated the original numbers of dead geese in the region of 1000, however, by the time official inspectors were able to get to the site foxes, scavengers and carrion birds had eaten many of the dead geese, so their count was lower at around 300. Martin Spray, Chief Executive of WWT said: “Following this natural disaster, it is now more important than ever that we help this species and grow its numbers, or in future such an event, combined with a variety of other threats it faces, could spell the end for it in the wild. The official inspection concluded that the single cause of these deaths was the extraordinary weather conditions. No other similar occurrences have ever been officially recorded. Takoradi, Jan. 25, GNA – The Red Colobus monkey is almost extinct in the country due to destruction of their natural habitat and hunting. Mrs Exorm Ametorelo Erskine, an Assistant Wildlife Officer at the Western Regional Office of the WildLife Division, told the Ghana News Agency on Tuesday that these monkeys used to be in rainforests at Bia and other protected areas in the country but there had been no sign of them for years. Mrs Erskine said the Red Colobus monkey dwelt on tall and big trees which had not been cut down some people hunt the monkeys and illegally export them. She said majority of monkeys help in the dispersal of forest trees. For instance, the Red Colobus eat the fruits of tall trees and drop the seeds somewhere to germinate. Mrs Erskine said some animals like the elephant also help in the germination of some forest trees. “If the seeds of such trees do not pass through the digestive system of the elephant, germination is not possible”, Mrs Erskine said. She said other endangered animals which are completely protected are Diana Monkey, chimpanzee, Bossman’s Potto, Long Tail Pangolin, Bush Baby and lion. Mrs Erskine said pythons eat animals such as rat, mice, grass cutter, birds and others which destroy crops and therefore help to keep the population of these animals in check. She said, “All wild animals, be it big or small, has a task to perform in the environment and not being aware of their specific function does not mean they are useless,” she said.